If you watch television, chances are you've seen the commercial... Stomp, Stomp, Stomp STOMPEEZ! If you have children or grandchildren, I'm almost positive that they have brought the commercial to your attention, begging for a pair of Stompeez. Am I right? 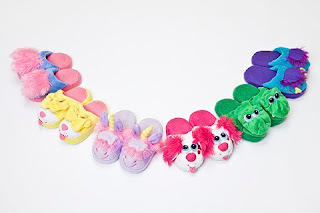 Stompeez are adorable, soft, colorful, fluffy, warm, and durable slippers for children (even teens and adults). Stompeez come in several cute, cuddly characters; All Blue Puppy, Unusual Unicorn, Growlin' Dragon, Perky Puppy, Be-Bop Bunny, Playful Puppy, Peek-a-Boo Kitty and Sir One-Eyed Monster! 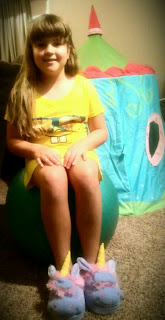 My daughter has been asking for a pair of Stompeez for months now! You should have seen her eyes light up and the big smile on her face when I put a pair of Unusual Unicorn Stompeez on the floor in front of her. She immediately jumped up, put them on and started walking around the living room. Instantly, you could her her giggles... she absolutely loved them! The eyes popped up and down as she walked around the room. It was very entertaining and had her laughing out loud. "Stompeez animated slippers skyrocketed in popularity last year during the holidays, thanks to the soft, playful characters kids wear on their feet for stomping fun. And while popularity is a good thing, it also overwhelmed the brand, which at that time was new. Now under new management, Stompeez has stepped up its production and distribution efforts to ensure it will be able to meet this year’s holiday demand with ease. The company works hard to create, promote and sell products that children and parents will love." Stompeez stuffs fun and imagination into ordinary slippers for kids. These cute, soft, comfy slippers are a hit at slumber parties, as well as for just romping around the house. Stompeez are available in eight colorful animal characters that pop to life with each step. They come in sizes to fit kids of all ages, from toddlers to teens. With the holidays approaching, Stompeez are affordable and unique gifts at $19.95 plus shipping and handling. Stompeez slippers are ready to ship with a guaranteed delivery date, including in time for the holidays. A new 60-day money-back guarantee also backs up the quality and value of each pair sold. 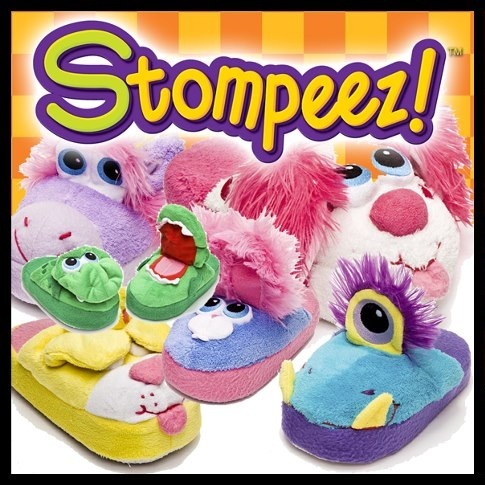 Stomp into holiday shopping early & save, Stompeez is offering a $5 off coupon code, simply use SLIPPER at checkout! In addition, customers who order two or more pairs of Stompeez will enjoy free same-location shipping on each additional pair. Disclaimer: I received a complimentary pair of Stompeez slippers for the purpose of writing a review and hosting a giveaway. Regardless, I only recommend products or services I use personally and/or believe will be a good fit for my readers. The views and opinions expressed on this blog are purely my own. Results may vary. No monetary compensation was received. I like the peek-a-boo kitty for my daughter. probably peek a boo kitty for my oldest daughter. I'd pick the Sir One Eyed Monster pair! Unusual Unicorn for my little girl. I would choose the One Eyed Monster for my son! I would love the peek a boo kitty for my daughter. The one eyed monster for my son! Growlin' Dragon for my grandson. I would choose the Unusual Unicorn for my 8 year old daughter. I would pick the Growlin' Dragon for my grandson Carter! So cute! My daughter would love the Perky Puppy! I'd pick sir one-eyed monster for my grandson. I would choose the all blue puppy for my son! i like peek a boo kitty for my daughter! I would choose the All Blue Puppy Stompeez, and they would be for my son. I'd choose the Perky Puppy! I would pick the unicorns. I would pick Growlin Dragon for my 4 year old son. I would get Unusual unicorn for my 6 year old daughter. She has been asking for these since she first saw the commercial! I would choose the One-Eyed Monster for my son. I'd choose the blue puppy for our local foster kids pajama drive.